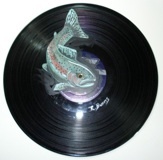 Trout on Vinyl - A Record Catch! 12x12”. Sure to bring a smile to your face. 6 Fish Party Cards with envelopes in professional packaging. Excellent quality paper and envelopes. These are great given as a gift as well. Cards are 4.25 x 5.5”. Species included: Dorado, Barracuda, Tuna, Golden Trout, Goldfish, Sea Bass. 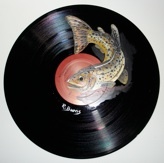 Flying Fish on Vinyl - A Record Catch! 12x12”. Feeling crabby? You’ll loves these cards. 6 Crab Cards with envelopes in professional packaging. Excellent quality paper and envelopes. These are great given as a gift as well. Cards are 4.25 x 5.5”. All images copyright Roxanne Burns. Do not use without permission. 10 Fish Cards with envelopes in professional packaging. Vivid colors and unusual species make these cards unique. Excellent quality paper and envelopes. Make a great gift. Cards are 4.25 x 5.5” each. Species included: Snipefish, Rockfish, Coho and Sockeye Salmon, Spike, Sandfish, Garibaldi, Gobi. Bull Trout. Printed on acid free, cotton fiber paper with archival quality inks. In a plastic sleeve for professional presentation.These are great given as a gift as well. Print area is 8x10 inches. Mat is black and measures 11x14”. These fit in any standard 11x14” frame form your local craft or frame store. One of a kind original acrylic painting on a vinyl album. Framed. Black wood frame with glass over the album. Background behind album is black. (Shown white in this picture for viewing purposes.) Framed. For shipping quote email your zip code. One of a kind original acrylic painting on a vinyl album. Black wood frame with glass over the album. Background behind album is black. (Shown white in this picture for viewing purposes.) Framed.